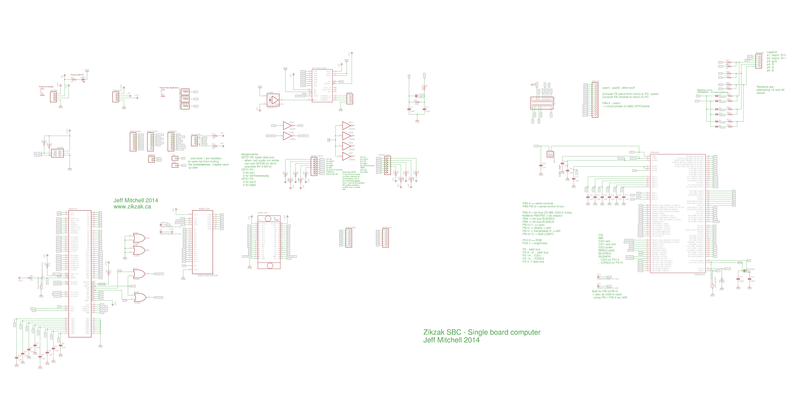 There have been a number of revisions; the general process has been to build up a little breadboard or perfboard for a small circuit, to test specific things; an atmel micro driving a ps/2 keyboard; an atmel driving a monochrome VGA output; reading an SD card, etc. See the revisions page for notes of what-is-what. One of the more interesting prototypes was 'rev 3', which was a big hardware switching RAM based VGA output system; this was true hardware double buffering, with the cpu picking which of the two framebuffers was to be shown. The cpu could switch the RAM (ideally during vblank to avoid tearing), and coudl _Write_ to the non-visible framebuffer, while the visible framebuffer was wired to VGA with a “GPU” (as signal generatyor really, to step through the addresses and do sync signals, but not actualyl sending any pixel data.) It was an amazing little system, able to do full colour VGA output, crystal clear. Just astounding – but the complexity and chipcount were high. Examine the schematic and see for yourself! Fun to build, and I did it on a very large breadboard (10 little breadboards stuck together in fact), but my later revisions went for minimal approaches.. a few chips, instead of dozens.